The massive amount of CO2 we're pumping into the atmosphere isn't just warming the climate -- a quarter of it ends up in the oceans, where it works to lower the waters' pH level. The oceans have become 30 percent more acidic over the past 200 years as a result of human activity, a phenomenon that's already harming coral reefs, dissolving the shells of sea snails, an important part of the marine food chain, and threatening fisheries. Eventually, the world's going to be forced to take notice: according to a report from the U.N. Convention on Biological Diversity, the cost of acidification on lost ecosystem protections alone could top $3 trillion annually by the end of this century. The above map comes from researchers at Columbia’s Lamont-Doherty Earth Observatory, and it shows what they call the "most comprehensive picture yet of how acidity levels vary across the world’s oceans": both an indication of what's happening now on a global scale and a benchmark to which we can compare further change. 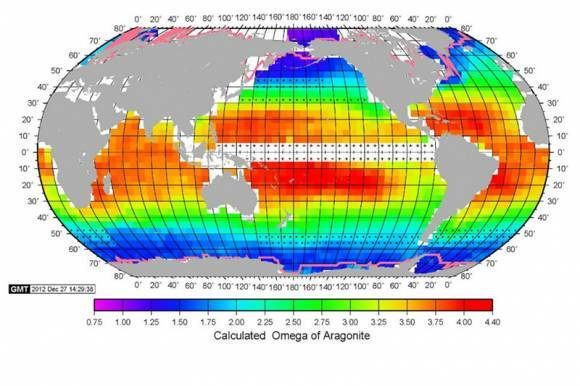 The team analyzed four decades' worth of data to come up with this picture of the ocean's state in 2005.